In 1998, when I left TBN, I wrote a book called Judgment Day. It’s 1998. The front cover of Judgment Day had the twin towers of New York City… The World Trade Center twin towers were exploding on the front cover of my book. A lightning bolt striking the twin towers. That was the front cover. Why did we choose that design? I have no idea other than the inspiration of the Holy Spirit. And so the book was called Judgment Day. Wiles is a Christian media counterpart to Alex Jones – he is an extravagant conspiracy theorist, and he makes regular appearances on the Jim Bakker Show. Guests on his TruNews radio show that have been noted by this blog include Judith Reisman, Rodney Howard-Browne, and Mark Taylor, co-author of The Trump Prophecies. It’s thus worth noting that Wiles is being somewhat selective in his memory of his 1998 opus. 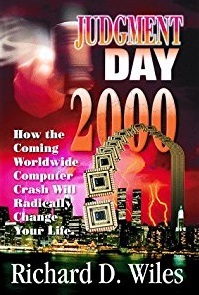 The book, published by the religious publisher Destiny Image (via its Treasure House imprint), was in fact titled Judgment Day 2000: How the Coming Worldwide Computer Crash will Radically Change Your Life, and it was just one of several Christian and secular paperbacks that scaremongered over the non-event of Y2K. Other examples from Christian figures included Grant Jeffrey’s Millenium Meltdown: Spiritual and Practical Strategies to Survive Y2K (Tyndale House) and Bakker’s Prosperity and the Coming Apocalypse (Thomas Nelson). God’s Judgment is Coming Soon! America’s darkest hour is ahead. A worldwide computer crash beginning in 1999 will plunge the global economy into a depression. Governments will declare bank holidays when panic spreads throughout society. The biggest meteor storm in 33 years will destroy several vital satellites. Violent solar storms will disrupt telecommunications and the electric power gird. Families will shiver in the winter of 2000 when electric utilities shut down. An oil shortage and severe drought will devestate America’s food supply. Drinking water will be rationed by National Guard troops. Terrorists will launch a coordinated attack in America’s 100 biggest cities. Is this science fiction or America’s future? In this explosive book, author Rick Wiles will stun you with unheard facts about Y2K. To your shock and dismay, you’ll discover the startling news that that the media isn’t reporting! Will the world banks fix their computers before December 31, 1999? Could the collapse of the Japanese and Russian economics trigger a global depression? Will Social Security and government checks be processed in 2000? Are there Russian commandos in America with nuclear suitcase bombs? How will the oil companies fix offshore drilling platforms before December 31, 1999? Will hospitals be DOA in 2000? Will the Pentegon fix military computers before December 31, 1999? Why are the Russian preparing for nuclear war? Why is the Nuclear Regulatory Commission distributing potassium iodine to civil defense agencies? Is the federal government anticipating war inside the United States in 2000? Richard Wiles is the founder and president of the Christian Business Association. The trade organization equips Christian entrepreneurs and professionals to take the Gospel into the marketplace and to finance the worldwide preaching of the Good News. As a sales and marketing professional, Mr. Wiles has held management positions at the Christian Broadcasting Network and Trinity Broadcasting Network. In 1994, Mr. Wiles narrowly lost a seat in the Maryland House of Delegates against a powerful incumbent in the closest legislative election in Maryland that year. Mr. Wiles and his family now live and attend church in the Dallas/FL Worth Metroplex. But we are now to believe that that book’s true prophetic message was hidden in the book’s cover, despite Wiles getting so many specific predictions wrong. The book’s opportunism is blatant, and works such as this ought to have engendered some scepticism towards those who claim to special religious discernment about future events. Yet the apocalyptic Christian paperback genre continues as it has, feeding off public fears about 9/11, wars in the Middle East and pandemics, as well as interest in celestial phenomena. Rather than be embarrassed by his 1998 book, Wiles has shown that with a few revisionist tweaks even the most egregious failure can be made once again fit for the purpose of self-promotion. 1. Yes, it appears that Wiles’s scatter-gun approach to extrapolating from current affairs included one detail that approximated to a reality – although from what I can see from Google preview, it seems that he associated Islamic terrorism primarily with “Iraq’s Saddam Hussein and Libya’s Moammer Ghadafy”. And of course, 2000 did not see “a coordinated attack in America’s 100 biggest cities”.